Diocese of New York-New Jersey - BUFFALO & ROCHESTER NY: Parishes Join for "Family Day"
In an unprecedented and inaugural effort toward inter-parish fellowship, families from three Western Upstate New York churches gathered on 7 September for a day of prayer and fun highlighted by a visit to the Buffalo Zoo. The parishes - Ss. Peter & Paul, St. George (Buffalo), and St. John the Baptist (Rochester) - participated thanks to the initiative and efforts of recent graduates of the Diocesan Diaconal Formation Program: Deacon Dr. Mark Hoeplinger and Sub-Deacon Sean McNulty. Following this extremely successful event, future fellowships are planned. 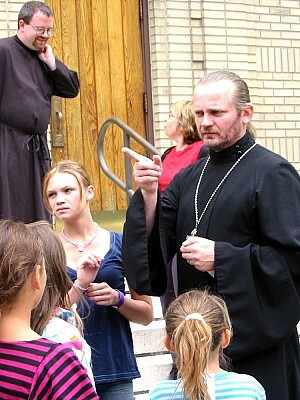 The "Family Day" began at Saints Peter and Paul Church, the recipient of the good will and labors exhibited by faithful throughout the diocese during "OPERATION BUFFALO" in 2011. Now revitalized and under the spiritual care of Father Volodymyr Zablotskyy, the parish welcomed the families for an opening prayer (thanksgiving service) and a bountiful breakfast planned by Matushka Jeanne, assisted by Father Vlad. Then, it was off to the zoo! Saint George Church is conveniently located near the Buffalo Zoo ... in fact, the parking lot of the parish is "next door." Movements were coordinated masterfully as Father Jason Vansuch (recently assigned to the parish) employed modern technologies in communication with Matushka Catherine who was on-the-ground at the destination point. The afternoon of fun and fellowship culminated with the families reassembling at Saint George Church for Great Vespers at 4:00 p.m. A pizza party followed the service and was enjoyed by all. As friendships were made and renewed, everyone expressed a strong desire for increased fellowship in the future. "Saint George Church is very similar in history and demographic composition to our parish in Rochester," said Father Ken James Stavrevsky. "On the other hand, Saints Peter and Paul Church is more than twice older than either parish and has recently undergone a major transformation form 'dying' to 'thriving.' The joy that these three parishes will be blessed by frequent fellowship and cooperation has been actualized thanks to Deacon Mark and Sub-Deacon Sean working wonderfully with the respective parish priests and parishioners." The parishes involved, while in different cities, are all within about an hour drive from one another.